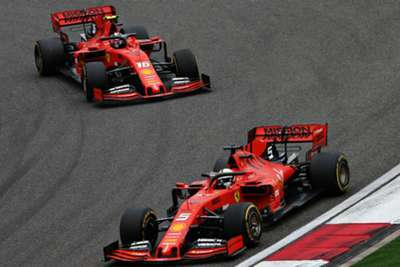 Ferrari team principle Mattia Binotto accepts Charles Leclerc would have the "right to be upset" after being ordered to let team-mate Sebastian Vettel past at the Chinese Grand Prix. Leclerc struggled for pace in Shanghai and, despite twice sounding reluctant to follow team orders when communicating with the paddock, by lap 10 he let Vettel through to allow the German the chance to try and catch flying Mercedes duo Lewis Hamilton and Valtteri Bottas. It proved a fruitless task, as Hamilton led Bottas over the line for a third Mercedes one-two in as many races in F1 this season, while Vettel finished third and Leclerc limped home fifth behind the Red Bull of Max Verstappen. Addressing the issue after the race, Binotto said he would understand if Leclerc was unhappy with the team's strategy. "I understand the feeling of Charles. At that stage of the race Mercedes were faster. We had to give Sebastian a go," he told Sky Sports. "It was not to try and give an advantage to one driver. From a team perspective our strategy would not have changed [if Verstappen had managed to overtake Vettel]. "If Charles is upset he is right to be upset and we accept it." Leclerc was philosophical about the decision, choosing to keep his counsel when addressing the incident with reporters post-race. "There is for sure a reason behind this decision. Overall the weekend I have not been as strong as I wanted," he said. "Overall today was not a good day but we will come back stronger. I need to look at the data and speak with the engineers. I don't want to make any silly comments. We will look forward now." Vettel believes Ferrari made the right call and expressed sympathy for Leclerc. "I felt I could go faster. Then it was a bit difficult for me to find a rhythm," Vettel said. "We were just not able to stick with Mercedes. It's a shame he couldn't get Max in the end. Plenty of homework for us. It's a good result but not a great result." Manchester United's Paul Pogba is a controversial selection in the PFA's Team of the Year. Using Opta data, we examine if he is worthy.